In this session, David Wentworth, Principal Learning Analyst with Brandon Hall Group, and Mandy Smith, VP of Training and Development at SWBC join eLogic Learning to discuss the current compliance landscape, addressing the challenges and possibilities it presents. With the brisk pace of learning technology innovation today, the choices are staggering. And with so many options, finding the best solution for your needs can be a lengthy, mind-numbing chore. 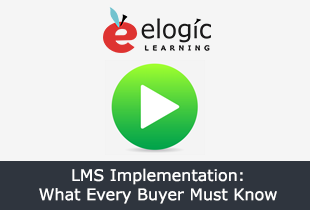 Shopping for a learning management system (or even just thinking about it) can be confusing or overwhelming with over 1000 vendors to choose from and prices ranging from free to $75,000 or more. While certain compliance standards extend to all organizations – Equal Employment Opportunity (EEO), etc. – evolving continuing education (CE) requirements present unique challenges to the financial, legal, and healthcare industries. Unfortunately, many of the available tools cannot handle complex CE reporting scenarios, causing frustration for training & HR managers forced to perform the work manually. In this informative session, John Leh, CEO & Lead Analyst of Talented Learning and Bill Snowdon, CTO of eLogic Learning discuss continuing education market and tips to manage rapidly changing and complex CE requirements with advancements in technology.